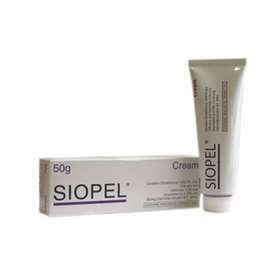 Siopel is a barrier cream which is resistant to water and contains antiseptic properties. This is useful if the skin needs to be shielded from water soluble irritants. Always clean and dry the area that you are going to apply the cream to. Apply the Siopel sparingly to the affected skin area and rub it in well. You will normally apply the Siopel Cream 3-5 times a day for the first three to four days, then once or twice a day. Always read the enclosed information provided before use. Keep out of the eyes, ears and the reach of Children. The Siopel Cream is for external use only. Avoid application to the ears and eyes, and any deep cuts involving the head or spine. If accidental contact does occur wash out with copious amounts of water. Do not use if you are allergic to peanut or soya, as Siopel Cream contains Arachis Oil (peanut oil). Dimethicone 1,000 Ph.Eur.10% w/w and Cetrimide 0.3% w/w (equivalent to 0.75% v/w Strong Cetrimide Solution B.P. 40%). Contains Arachis Oil (Peanut Oil).